Situated opposite each other across the sea, Zanzibar and Bagamoyo has similarities yet the atmosphere is totally different from each other. In both places you can feel the winds of history in the pebbled streets and people are as amiable. Bagamoyo is sleepier and smaller, less people, less busy. But it is wakening up. There are already some sizzling activities on the move. Some movers and shakers has chosen to live here, steering things up. 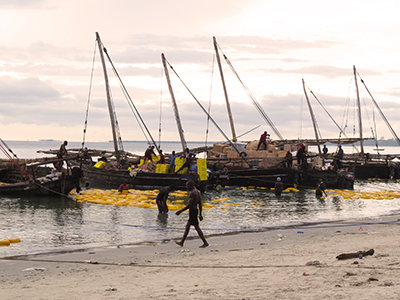 The harbor in Bagamoyo is vivid as people are doing business on the beach from dusk to dawn, mostly with various fish or transport of goods across the sea. Around this the food mama´s comes with their mini restaurants- as everybody needs to eat. In the morning it is highly recommended to go down early to chit chat with the people and to watch the dhow boats being loaded to bring goods to Zanzibar. One day we will go with them, it takes 4 hours. 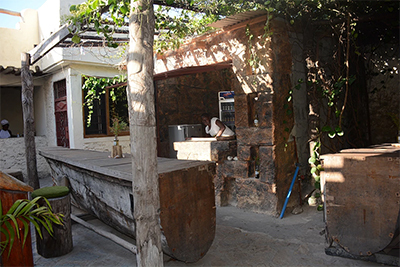 There are some cool places in Bagamoyo. Nashe´s Café is one. As it was Friday we were drawn to the music at Nashe´s- heard all over the streets. We sat down under the sky on the roof top, and was royally entertained by the DJ taking us back to the Motown era while watching the Tanzanians effortlessly moving their bodies in contagious moves. On the wall a big screen with the music video with funny costumes and huge hair cuts being displayed on the wall. Priceless! And all under a canopy of stars accompanied by thunder and lightning. We loved it all! Another cool place is Firefly. Bar, restaurant, pool, camp site, shop…and much more. Awesome atmosphere. 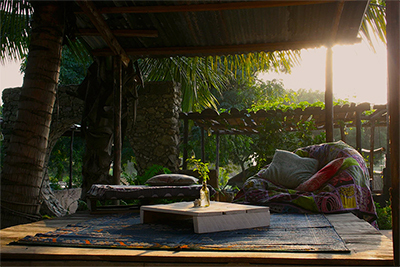 Here you can stay for around 60 usd per room. We would have loved to sit in the bar, or by the pool, or in the lounge and hang out, maybe work a little, drink a coffee. But we had to move on to our Saadani safari. But next time…..
Poa Poa Restaurant (or Inn but they do not seem to have accommodation anymore) is located opposite to Nashe´s Café and is a perfect place for smoothies and coffee and to observe the street life. And it is located next to an interesting art gallery. Things are cooking in Bagamoyo…. 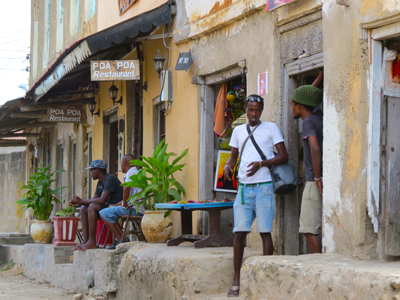 There are much more to say about Bagamoyo, especially about the history. If you are around Dar Es Salaam going north, Bagamoyo is definitely worth a visit. Contact us if you want advice how to get there.